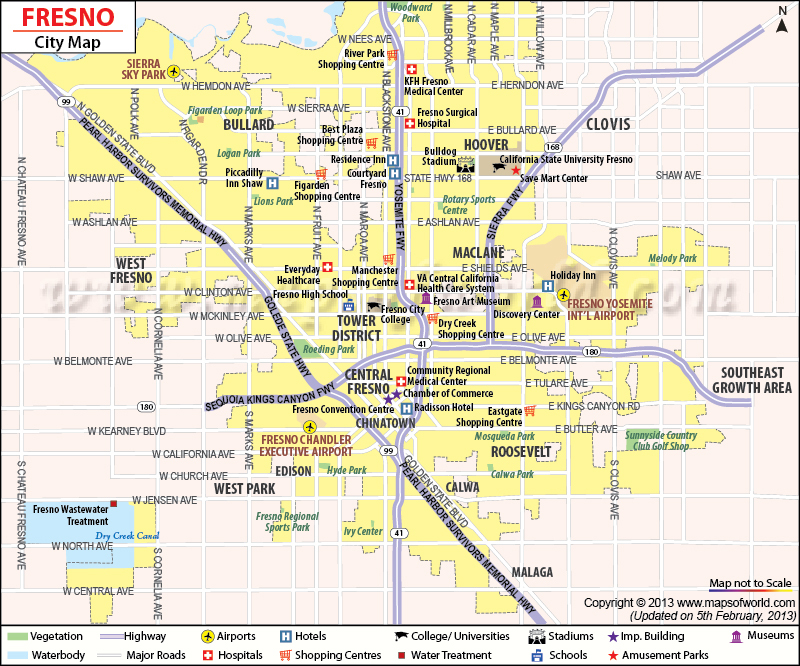 Fresno City Map helps you get around California’s fifth most populous city. Find places of interest in Fresno City and the fastest way of getting there. Fresno is the county seat for Fresno County with a population of 527,438 (2017). Located in the central part of California state, Fresno City lies around 170 miles south of Sacramento, 185 miles southeast of San Francisco and 220 miles northeast of Los Angeles. Fresno goes back to 1872 when it was a railway station depot for the Central Pacific Railroad line. By 1885, Fresno was formally incorporated as a town along the San Joaquin River and people began moving in. Fresno City is home to a lot of commercial activity around the Fresno County and San Joaquin Valley area. Large scale agricultural activity remains central to the Metropolitan Fresno region. Higher education is centered around California State University also known as Fresno State. The university boasts of a massive 1,011 acre farm and is credited for operating the first campus-based commercial winery in the U.S. Nature lovers have a choice of visiting the famous Yosemite National Park - 60 miles north; Sierra National Forest – 40 miles northeast; Kings Canyon National Park – 60 miles east; and Sequoia National Park – 75 miles southeast. Santa Fe Passenger Depot (Fresno Station): This is the main station serving the Amtrak California’s San Joaquin line. The Fresno City Map will help you reach other stations in the Metropolitan area. Fresno City will be on the California High Speed Rail map as the project comes up. Fresno Area Express provides the public transportation services in the Fresno Metropolitan Area. The intercity city services is provided by Greyhound and Orange Belt Stages.